The INFINITI Q50 is a sophisticated luxury sedan with amenities the whole family will adore. Mike Ward INFINITI, conveniently located in Highlands Ranch, is offering a feature-filled 2018 INFINITI Q50 3.0t LUXE to our customers. The LUXE trim focuses on amenities that offer drivers and passengers a full immersive luxury experience. This stunning car does not disappoint! This is one of our final 2018 Q50s in stock, so don’t miss out on this amazing sedan from Mike Ward INFINITI. Whether commuting on I-25 or adventuring up mountain passes, this 2018 INFINITI Q50 delivers exhilarating performance. Under the stylish hood, a 300-horsepower 3.0-liter V6 engine provides amazing power, a must for driving enthusiasts. Paired with the robust engine is an efficient electronically controlled 7-speed automatic transmission, featuring dual automatic transmission coolers and convenient Hill Start Assist. An effective all-wheel drive system provides excellent traction on slippery road surfaces. Enjoy outstanding fuel-economy with this stunning 2018 INFINITI Q50 LUXE, earning an estimated 19 MPG in the city and 27 MPG on the highway. Spend less time at the pump on your next family road trip! * ProASSIST Package – Features a whole suite of world-class driver safety systems including Forward Collision Warning/Emergency Braking, Around View Monitor with Moving Object Detection, Blind Spot Warning, Front and Rear Parking Sensors, and so much more! * ProACTIVE Package – Builds on the safety features of the ProASSIST Package, adding Intelligent Cruise Control, Lane Departure Warning/Prevention, Blind Spot Intervention, Direct Adaptive Steering, High Beam Assist Headlights, and many more helpful features. * Sensory Package – Adds luxury features the whole family will love including a 16-speaker BOSE Performance sound system, Advanced Climate Control system, driver memory settings, auto-dimming door mirrors, and more! * Essential Package – Features some of the most popular luxury amenities including the INFINITI InTouch Navigation system, heated front seats, remote engine start, heated steering wheel, SiriusXM Traffic, and much more! Don’t miss out on owning this amazing new 2018 INFINITI Q50 30t LUXE. 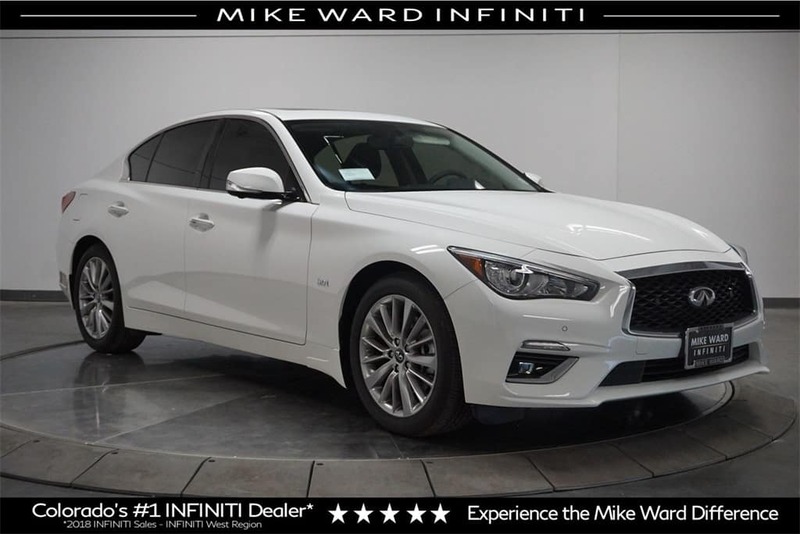 Priced at Mike Ward INFINITI’s low price of only $52,885, this amazing sedan is perfect for any budget. Make your way over to Mike Ward INFINITI near Denver for a test drive today!